Les Chalets de Jouvence is located in the traditional Les Carroz village. This is within the Grand Massif ski area giving you access to 148 slopes. What's more, this property is located only 50 meters from the nearest ski lift, meaning you won't have far to go in the morning before hitting the slopes. The Les Chalets de Jouvence apartments are nestled deep in the Les Carroz village and offer beautiful rooms in traditional alpine designs. Within the property are rooms catering for groups of 4-8 people offering a variety of layouts. When staying at the property, you'll benefit from wellness facilities including an indoor heated pool, steam rooms, sauna, hot tub, and a fitness room, as well as the option of massage and treatment services nearby. There are also ski lockers for you to store your equipment and WiFi is available. 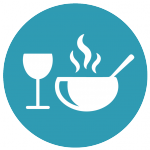 For those that enjoy cooking and want to try their hand at local French cuisine, then there is the possibility of loaning fondue or raclette sets. If you're travelling with young children then you can benefit from cots, high chairs, bottle warmers and safety plug protectors (subject to availability and request). Great location close to the lifts meaning you won't have far to go each morning to get the first lifts. Wonderful views from the terraces and balconies allowing you to embrace your surroundings. Enjoy fitness and relaxation in the heated covered swimming pool, sauna, steam bath and fitness room. Or if you prefer visit he Ô des Cimes treatment centre.